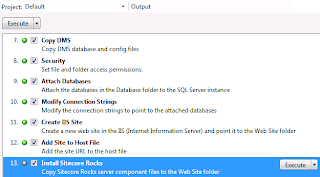 If you have not installed Sitecore Rocks, please check out this blog post that describes how to Install Sitecore Rocks. 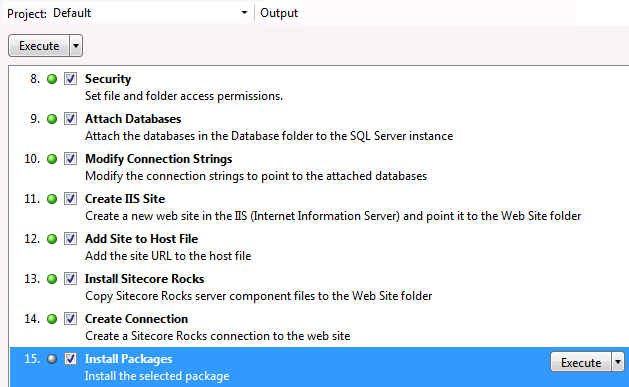 After you have installed Sitecore Rocks this QuickStart will guide you through the process of creating your new Sitecore Instance. 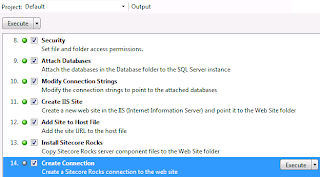 Sitecore Rocks is an extremely valuable tool for starting a new project. 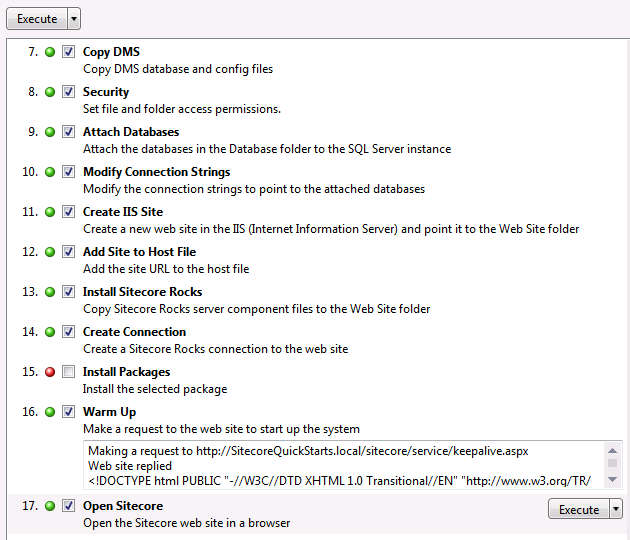 Below are the steps for creating a new Sitecore Instance using Sitecore Rocks. First of all, the link below says "Creating a new Sitecore web site". More accurately, this link should read "Create a new Sitecore Instance". In most cases, the website created with this wizard will not be the one you use for your production websites. This will be discussed in future posts. 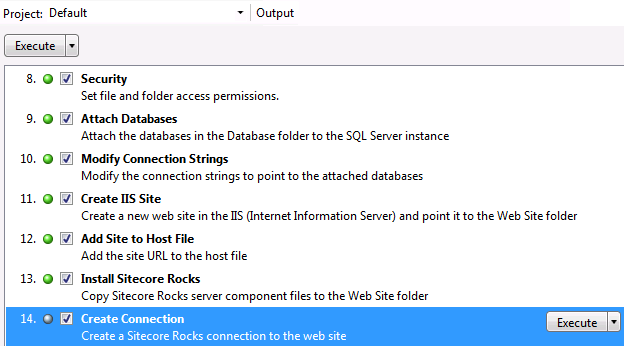 Here are the steps for Creating a new Sitecore Instance using Sitecore Rocks and Visual Studio. Step 1: Open Visual Studio and click on the Start Page. Click on the link that says "Create a new Sitecore web site"
Step 2: Click on the first step but do NOT click Execute yet. If you do you will get errors about required fields. Step 3: On the right hand side you will see a box that says "Sitecore Zip File"
Step 5: When the browser opens and you log in, choose your version of the product. 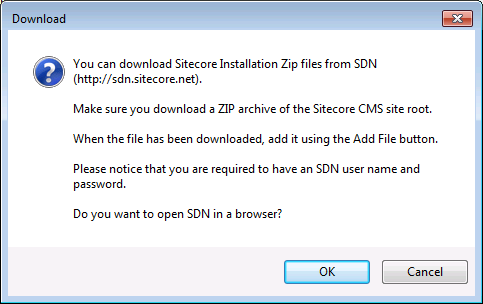 Step 6: Make sure when you download the version that you choose the zip file to install Sitecore Manually. This is highlighted in yellow. You will be prompted to accept the license agreement then the file will download. Step 7. Once downloaded return to Visual Studio and click on the "Add File" Button. 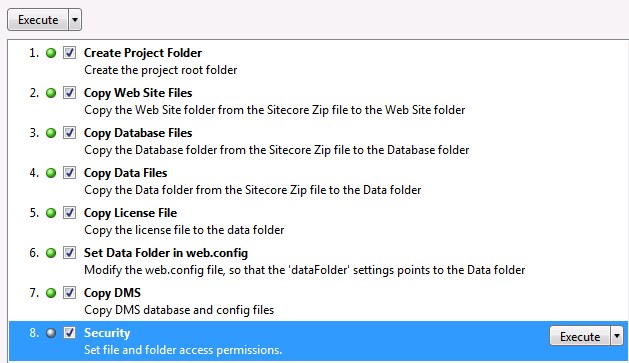 Step 10: On the right hand side look for "Sitecore License" Click Add File to add the license file. Select the license file and click OK. Step 12: Load any Packages you require for this build. Note: you can use repositories for your packages to share across the team. NOTE: This feature sometimes causes issues the first time using it. If this happens you can remove the packages here or simply skip the step later and manually upload your packages in the Sitecore Admin. Step 13: Now that all the info is entered Click execute beside the first step. Once completed you will see the green circle upon success. Step 14: Click on step 2 and click execute to copy web files to your project folder. Step 15: Click on step 3 and click execute to copy database files to the database folder. Step 16. 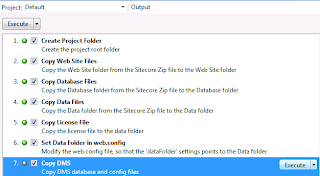 Click on step 4 and click on execute to copy the data folder from the build. The data folder contains the package, logs and license folder. Step 17. Click on step 5 and click on execute to copy the license file into the license folder. Step 19. 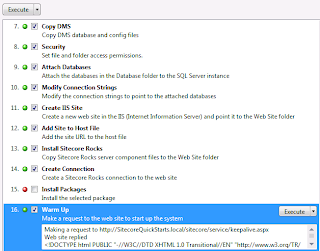 Click on step 7 and click on execute to copy the dms database and config files. Step 20: Click on step 8 and click on execute to set the file and folder permissions on your project folder. 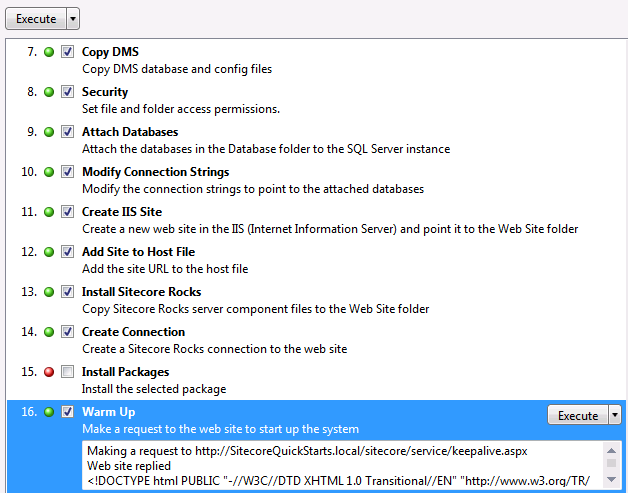 Step 21: Click on step 9 and click execute to attach the Sitecore databases to your instance. Step 23. 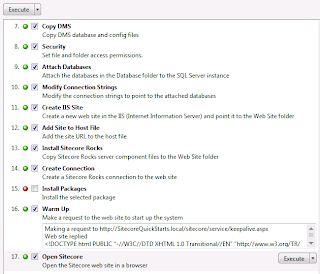 Click on step 11 and click execute to Create the IIS Site. NOTE: This sets up the default site with your project name eg. xyz.local. You will need to manually set up IIS for your actual host headers. Step 24. Click on step 12 and click execute to Add the site to your host file. NOTE: This sets up the default site with your project name eg. xyz.local. You will need to manually edit the host file for your actual host headers. Step 25. Step 13 is a very important step. 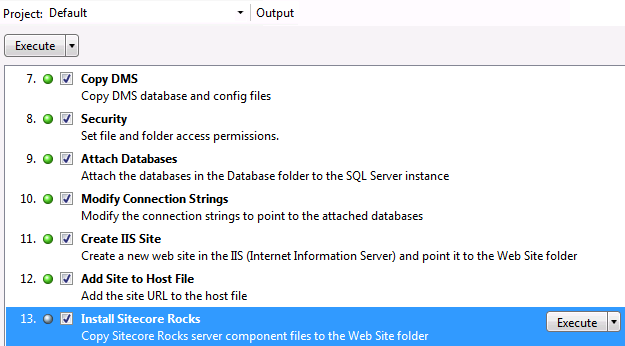 It installs the Sitecore Rocks Server Components. By doing this you open up Sitecore Rocks to allow you access to perform a larger number of tasks not supported by the standard Sitecore Web Services. Click on this step and click execute. 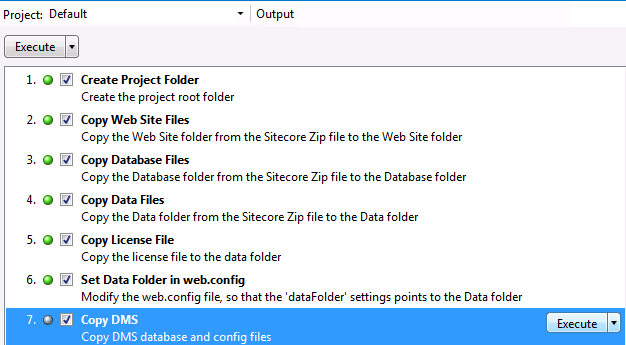 Step 26: Step 14 creates a connection on the client side (in Visual Studio) that will connect with the web services on your Sitecore project. Step 27. 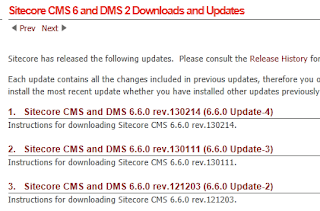 Step 15 will install any Sitecore packages you listed in the package section. 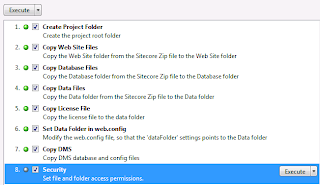 This component relies on Sitecore Rocks being setup and proper permissions to be provided. If you are getting error regarding timeouts or permissions you may want to unchecking this option and install the packages using the Sitecore Admin at the end. 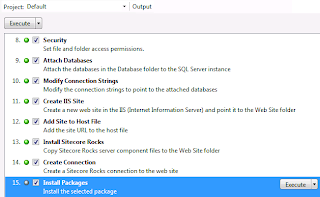 Alternatively you can read our next post on "Troubleshooting Issues Installing Packages Via Sitecore Rocks". Step 28: Click On Step 16 and click execute. This will try and hit the keepalive.aspx page in Sitecore. Step 30: If you skipped installing the Sitecore Packages you can do so manually by following the steps in our article on installing Sitecore Packages. I downloaded the only zip file for SiteCore 7 and I cannot find the license file for it in the download. I have extracted the files from the Zip file. 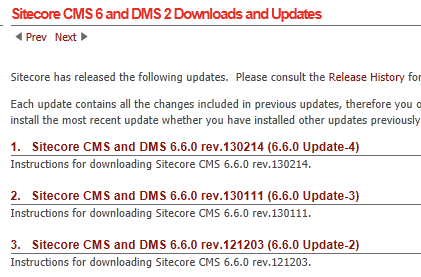 The license file is received from Sitecore. 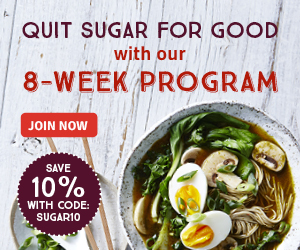 You need to purchase it or if you are a partner then they provide you with a development license. If you need assistance email me at chris.williams@techguilds.com and I can assist you.